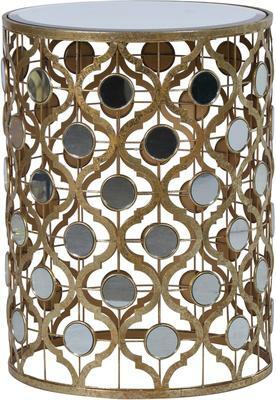 This Mirror Topped Side Table offers beauty and intricate elegance. Made for lush interiors, the table is handmade by the experts. It echoes a cylindrical design with the entire body made from metal. There are circular mirrored inserts added to certain parts as well. This creates a unique, almost Moroccan feel, to the side table. 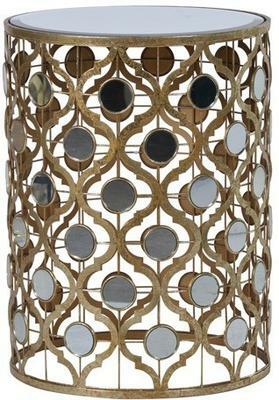 Use this as a decorative accent in your living room or maybe keep this inside your bedroom as a bedside table. It can hold a lamp, a statue, or even a stack of books if you like. Above all, it simply looks striking and would easily complement any type of space.